The Rover 200 is an interesting example of `badge-engineering’. The car started out as the Honda Ballade and evolved during the period when there was a strong relationship between Austin-Rover and Honda. The Triumph Acclaim was another `badge-engineered’ car from this relationship. In the early 1980s the British company did not have the funds to develop a wider range of models to make it more competitive and Honda was looking for a way of entering the British and European markets when the most obvious way was blocked due to a limitation on Japanese exports as a whole. Honda has long been a technical leader as far as the Japanese motor industry is concerned and the Ballade had some interesting features. It was, naturally, front-wheel driven because Honda accepted the logic of front-wheel drive long before most other Japanese car manufacturers had adopted it. It had built nothing but front-driven cars for many years and, incidentally, much later added some four-wheel drive versions to its range. Honda engine designs have always been noteworthy, and the Ballade/Rover 213 unit was no exception with its use of three valves per cylinder: two small inlet valves and the larger exhaust valve made for easier gas flow than could be achieved with just two valves. All the valves were operated by rocker arms from a single overhead camshaft. And this is where the unusual twist in ‘badge-engineering’ occurred, since the Rover 200 did not use only the Honda engine. While the Rover 213 was equipped with the 1.3-litre Honda engine driving through its own gearbox, or optional three-speed transmission, the Rover 216 was powered by the 1.6-litre Austin-Rover S-series unit driving the front wheels through a different type of Honda five-speed manual gearbox. And in this case, the optional automatic was not from Honda at all, but was a four-speed unit from the German ZF company. In other words, part of the agreement which gave rise to the Rover 200 was that apart from assembling what is virtually a rebadged Honda Ballade, Austin-Rover would also adapt the design to accept its own bigger engine. This enabled the car to be offered over a fairly wide range of models of 52, 63 and 77kW respectively, the highest output being that of the 1.6-litre engine when equipped with electronically controlled fuel injection. 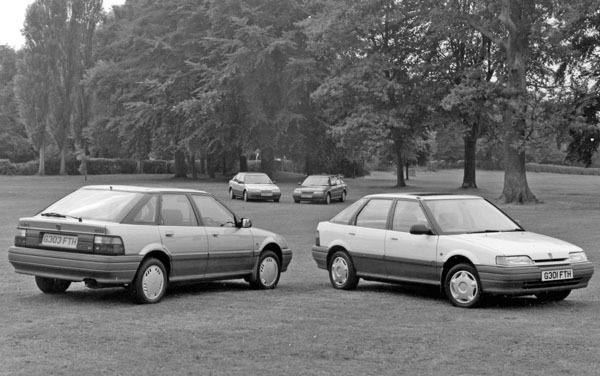 In other respects the Rover 200 differed little from the Honda upon which it was based. One area of interest concerned the suspension. Honda has a long tradition of making cars with MacPherson struts for all four wheels but the Ballade/Rover differed from earlier models in two ways. Although the front suspension still used MacPherson struts these took a different form having coil springs wrapped round the damper struts themselves, with the springs being an ingenious combination of torsion bars and tubes which were both compact and effective. At the rear the design was more traditional with the wheels mounted at each end of a very light, carefully located ‘dead’ axle. In many ways the Rover 200 was important for Austin-Rover in the British and European markets although it was not of itself a significant car.